Frolic in the outdoors has its cost. Day by day that sun builds up on any exposed skin, even if you aren't big on tanning. For a relatively pale person and sunscreen junky I even have a little color on my arms and face from the hours I have spent out in the backyard. Some of this summer's activities for me have included stripping and refinishing my bathroom door and one of my 100+ year old windows. All the paint removal and sanding was done outdoors to prevent mess and contamination of the house. Some of those days out on the parking pad were hot, hot, hot and directly in the sun for the whole day! Despite use of sunscreen of 30 and higher I still have the telltale freckles and peachy color that are my body's version of a tan. Though you may not be in situations of extreme exposure like that sun damage can build up gradually just from walking to and from your car or other brief activities like that. Anything counts. Your skin doesn't play, and UV exposure is UV exposure no matter how you slice it. If you value your skin (and it is your largest organ!) you should be taking pro-active measures to keep your skin in top condition. Over time that UV exposure will cause the elastin in your skin to degrade, causing loss of firmness and wrinkling. Discoloration and uneven pigmentation is another long term result of overexposure. The big C (cancer) can result as well. On a trip to Colorado earlier this year several estheticians in the area advised me that the incidence of skin cancer is very high among residents in their area of the country due to the outdoor lifestyle and higher elevations. 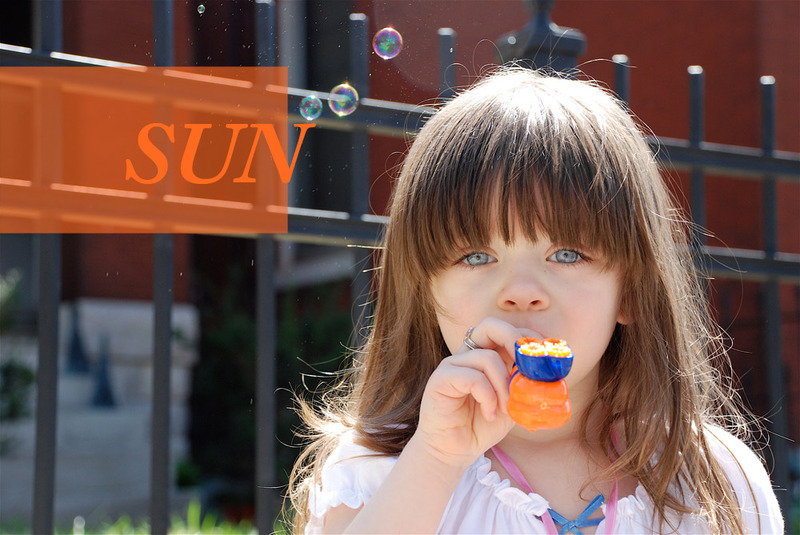 Thinner air and close proximity to the sun means increased exposure. Sunscreen is not the only way to help skin protect itself. Antioxidants play a key role in keeping skin healthy much as they do the same internally. In particular an extract from Pomegranate containing a fraction known as Punicalagins helps protect cells against UV damage and degradation. This extract was previously used internally, but now is available as an external application. 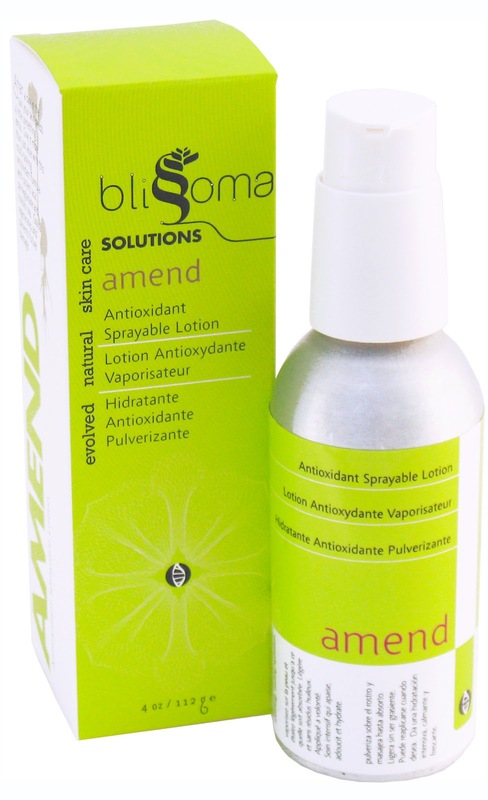 The science-backed research proving it's ability to decrease UV induced cell death, reactive oxygen species, and collagenases that cause collagen deterioration is the reason Blissoma has chosen to include this extract in a new antioxidant sprayable lotion called Amend. Amend is a super lightweight, intensive body treatment designed to prevent, soothe, and repair sun damage. It not only contains Pomegranate but a host of other antioxidant ingredients like organic Rooibos tea and Acai oil, plus soothing and reparative herbs like organic Linden flower, Heather flowers, and Comfrey. All these help build and repair collagen as well as minimizing long-term damage from daily or intense exposure. It can be applied before sunscreen because of it's non-greasy consistency. It has a fresh, delicious smell beloved by men, women, and children alike. Should you get a little pink it takes the sting right out and can be applied as often as desired while healing. And yes, it contains organic Aloe as well, so all the bases are covered. The ingredients list is cleaner than most plain aloe gels. No green color, no carbomer, no TEA, and no synthetic preservatives. I'm pretty picky about what goes on my skin and yours. There is no time like the present to start taking care of your skin. Just because it's August doesn't mean it is too late, lazybones! Get some Amend and feel the heal. When your arms are looking cute in 20 years you'll thank yourself for the bit of extra care you took now.